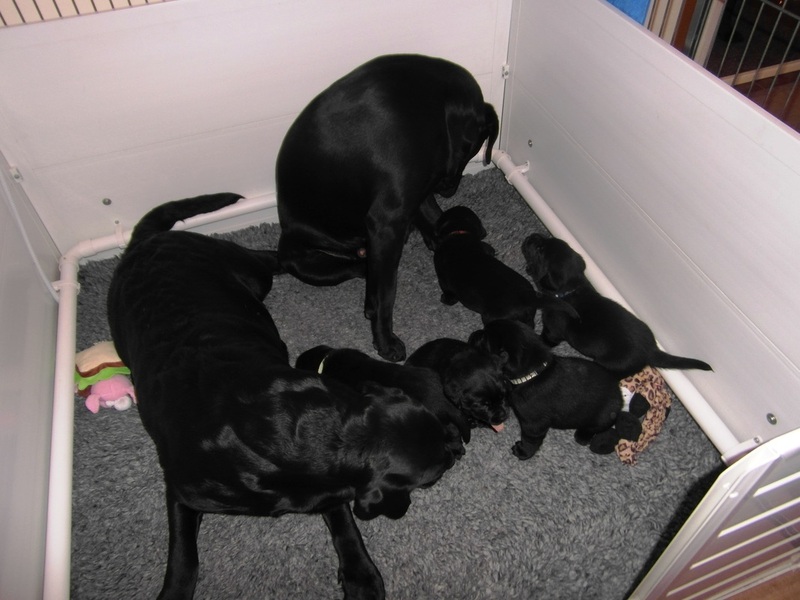 One of the first photos of Poppy and her puppies. Poppy wasn't at all keen to go in the whelping box and decided instead to get up on the sofa. 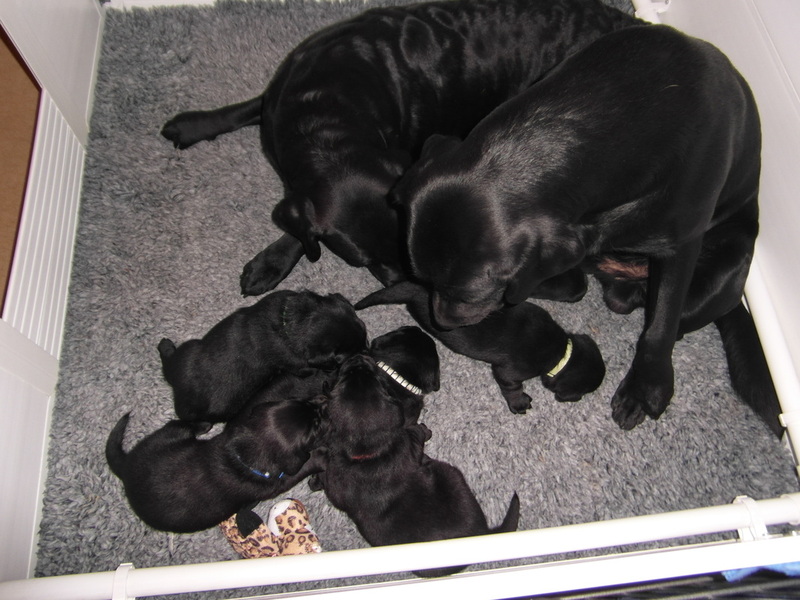 The only option was to put the puppies on there with her so they could feed whilst being closely watched. What a difference a day makes. 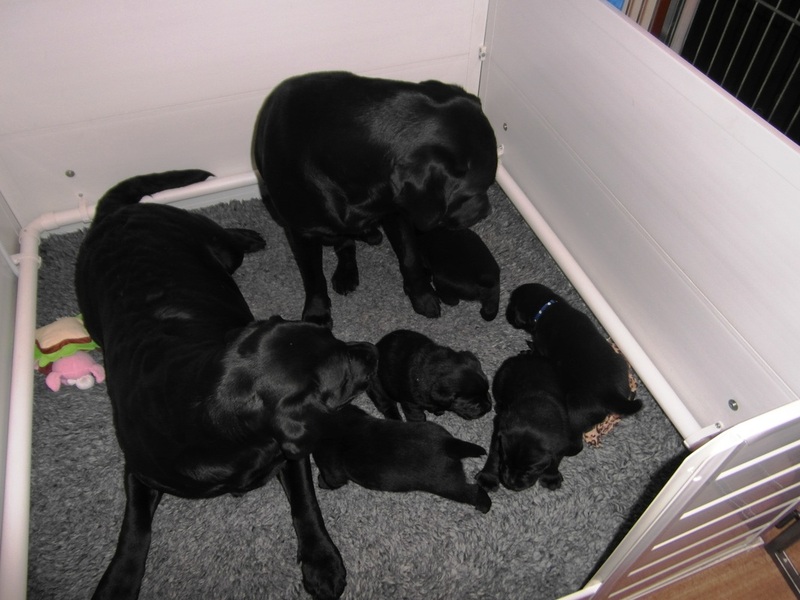 Poppy's now happily feeding the puppies in the whelping box. Last night I weighed each puppy and put them an ID collar on. On their own while Poppy stretches her legs. All snuggling up together while I clean the whelping box and put new bedding in. They're little tots now but it won't be long before they're too big to fit in this box together. In the last update before the puppies were born I started by saying that when you wake up in a morning you never know what life's going to throw at you. As I write this my heart is breaking. The little girl puppy died this morning. I tried for 15 minutes to revive her but in the end there was nothing I could do. She's the puppy my daughter and her family were having and they'd even given her a name. Two of my grandchildren, Eloise and Owen, giving the puppies cuddles. My very dog-savvy grandson, Luca, cuddling a puppy. Big sister Martha lays like this as well. Wouldn't you like to blow raspberries on his tummy. The puppies have been for their second car ride today. Their first was the journey home from the vets on the day they were born, today we returned to the vets for Poppy to have a check-up. Poppy loves Graham, the vet and went dashing into his room when he called us. Graham also gave the puppies a check-up while we were there and he was pleased with their progress. Mother and son having a cuddle together. These boys certainly like their cuddles. Poppy and her boys. What a difference a week makes, they've almost doubled their birth weight and already had their nails trimmed. Already well on their way to filling this box, I'll soon have to find somewhere else to put them while I clean out the whelping box. Poppy and her brood of boys. 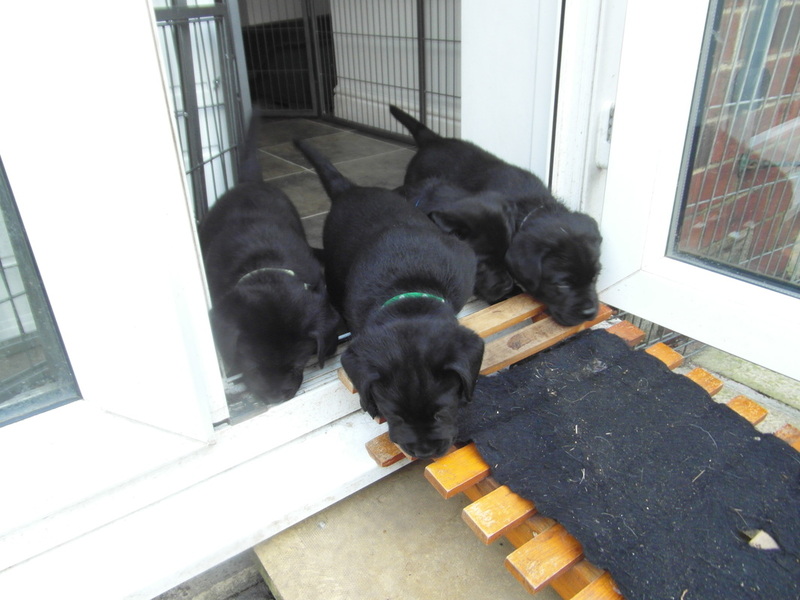 The puppies were born with no sight or hearing, relying on their keen sense of smell to locate Poppy at feed time. In the next few days all that will change. Their ear canals will open and they'll be able to hear and as I pick each of them up to look at them I'll eventually see a pair of little eyes peeping back at me. Their commando crawl will gradually become more of a drunken stagger as their legs become stronger. It will be time for the first worming on Wednesday, always a messy time. Not only because of the liquid they spit back out but because of Poppy's tendency to lick them as I have hold of them, stimulating their bladders to empty on my lap. The puppies have had their nails trimmed again today. They weren't too impressed with the electric nail grinder I used (one of them did a poo on my knee) but it gives smoother results than using scissors or clippers. As I looked at each of them as I lifted them out of the box there were little eyes glinting back at me. There won't be any photos of the puppies for a few days unless they're asleep or facing away from me as I don't want to damage their delicate little eyes with the flash. Poppy had her stitches taken out this morning and will, no doubt, be feeling much more comfortable. 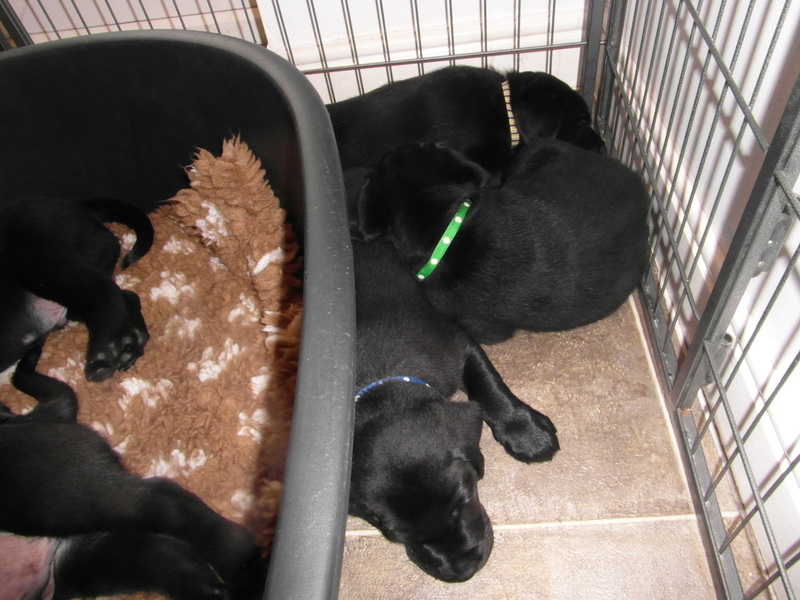 A sneaky photo taken while the puppies were snoozing. They were weighed and wormed yesterday and I actually managed it without getting too much of the pink worming liquid on my fingers. 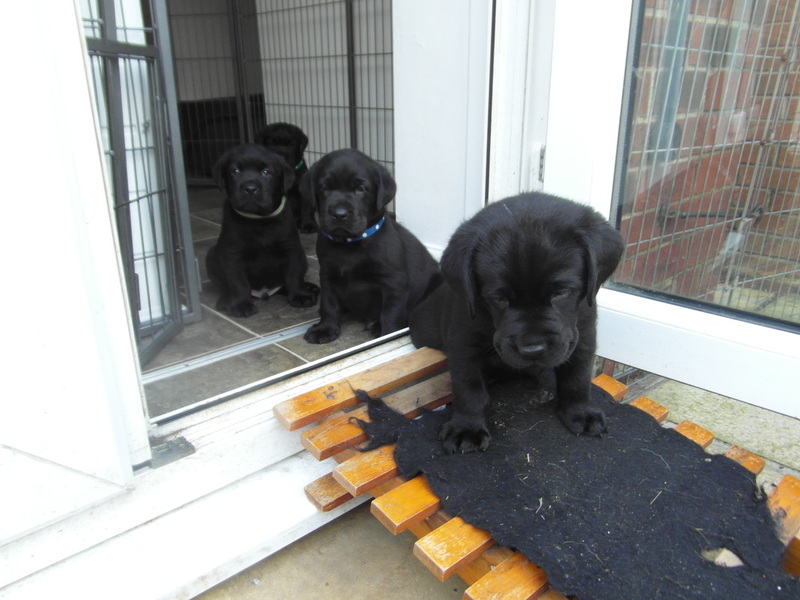 The puppies are getting quite vocal now, with lots of growls and squeals coming ftom the whelping box. They're also getting more mobile as you'll see in this video. Martha and Ned having a sneaky peep at the puppies while Poppy was in the garden. All snuggled up together in the corner - a pile of puppies. No need to worry about clearing the bowl, Poppy was more than happy to oblige once the puppies has eaten enough. Brotherly love. Two of the boys snuggling up together. Its a family affair. Poppy feeding one end while Martha cleans the other. 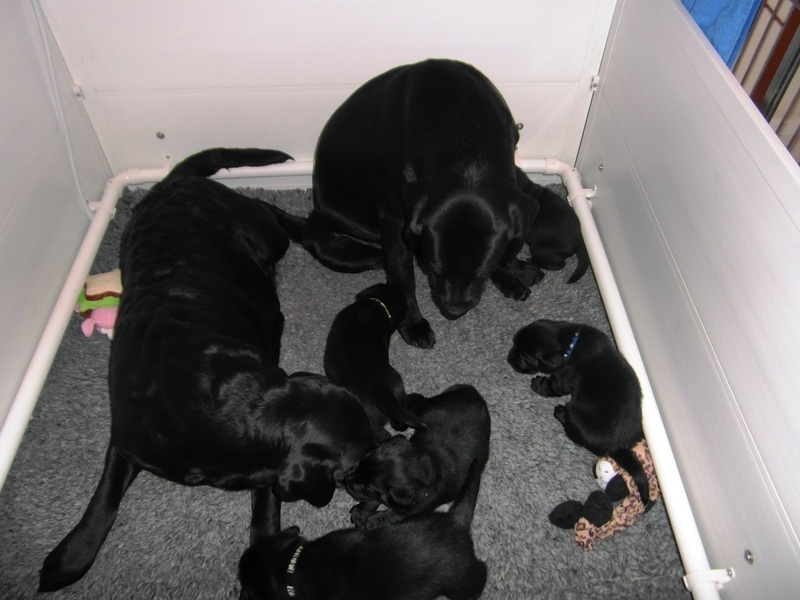 Click on each photo to see larger images of Martha and Ned in with the puppies today. Two of the boys chilling out with Poppy. Martha's started to go in with the puppies at every opportunity. Bonfire Night and my little 'crackers' in one of the dog beds while I clean out the whelping box. "Don't worry mum, I've got him!" Here's a video of Ned in with his little brothers. Mealtime. The puppies are now on 4 meals a day. Having a snooze after lunch. Mother and sons. . . . . .
. . . . . . . . . . . . . . and from another angle. Youngest grandson, Luca, with one of the puppies. "I'm watching you watching me watching you". 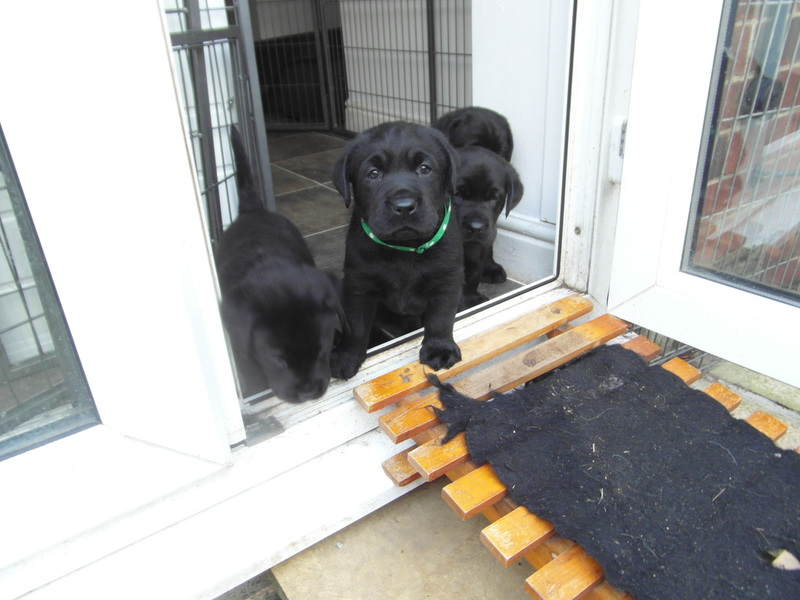 It's been all change today as the puppies have been moved through from the living room to the dining room. This is Poppy with one of her boys. One of the many reasons why Labradors are so popular is their temperament. I think this video of Ned and the puppies is testament to the marvellous temperament Poppy's puppies have. The puppies have been outside for the first time today. Click on each photo to enlarge it. 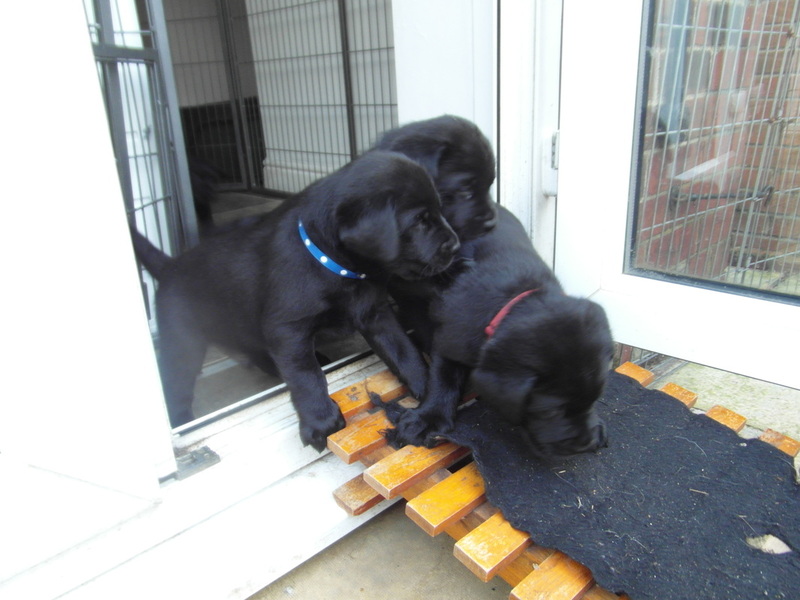 There's also this video of them playing - watch the one in the doorway playing 'bitey-face' with his brother. 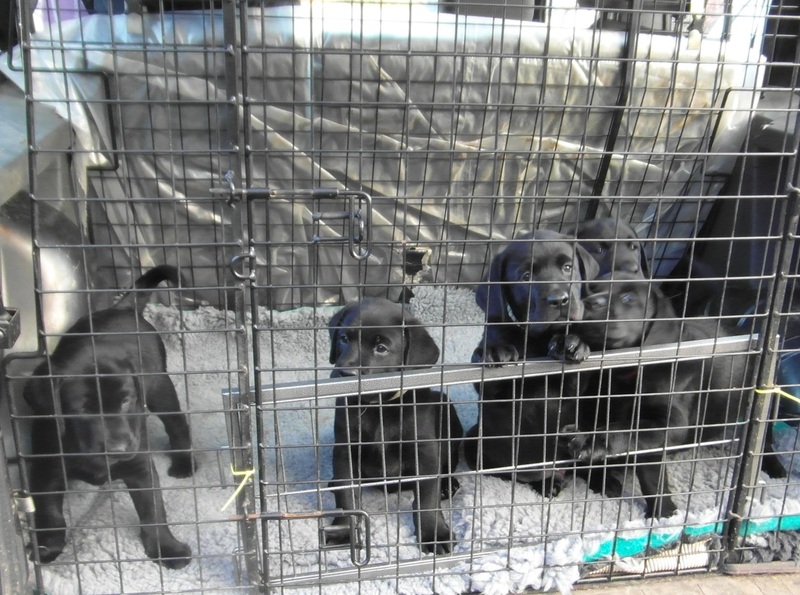 It was only a matter of time before one or more of the puppies managed to escape from the pen. Watch the little guy on the left, with the blue spotty collar. He was so quick I missed him on a couple of occasions. Plenty of room in the bed but some of the puppies prefer the floor. 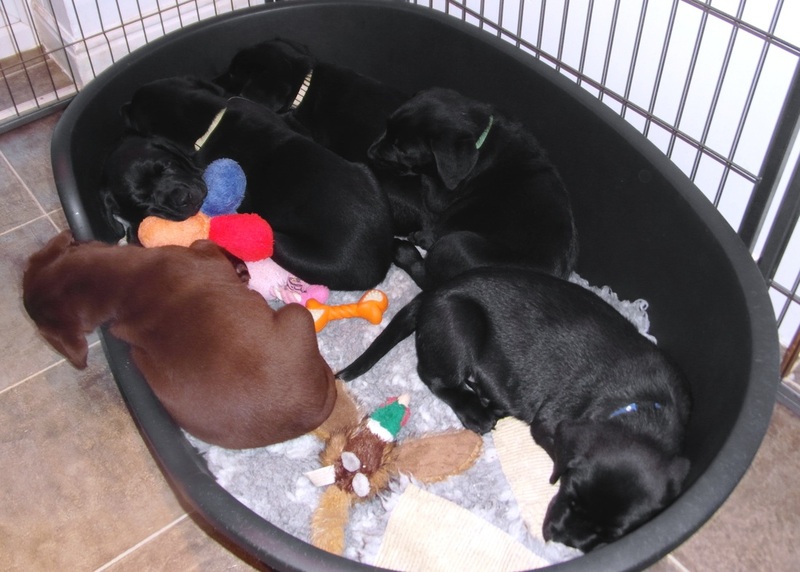 A very busy day for the puppies today as 3 families came to visit them. Here they are chilling out before the first family arrived. 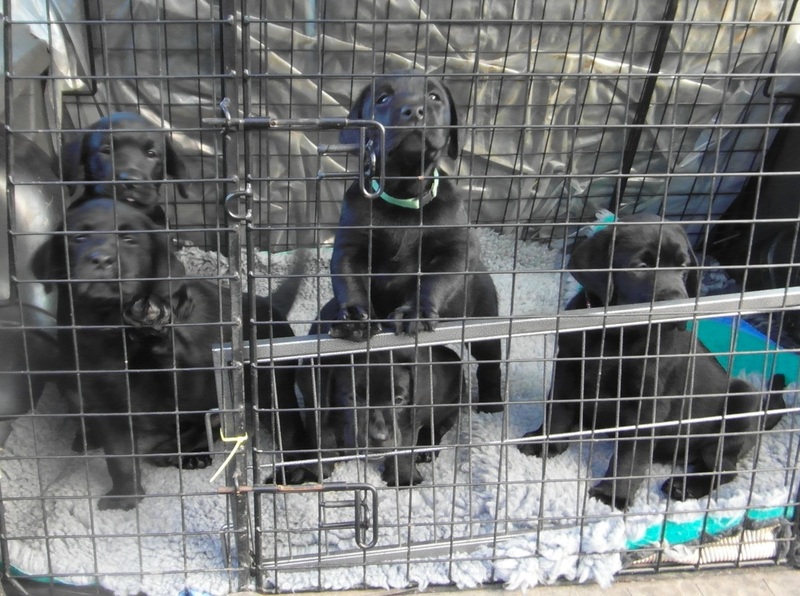 For anyone who has the least bit of doubt about just how mad Labradors puppies can be at times, just watch this video of the puppies this evening. I had to stop recording in the end, I couldn't keep the camera still for laughing. And the fun goes on. This video was taken at 7.15 this morning. 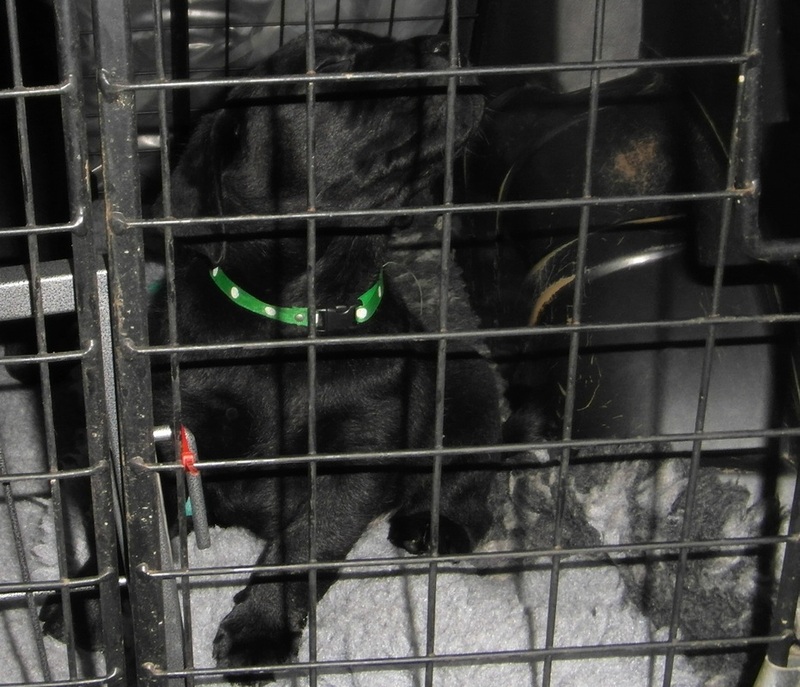 This afternoon the puppies went for their 2nd car journey, their first being the one coming home from the vet's on the day they were born (and for Annie, hers was the journey here on Sunday). They were so excited about being in somewhere different I struggled to get any decent photos of them. I always recommend the use of crates for puppies, as it's surprising how much destruction a young puppy can cause if left unattended. Today, in my hurry to clean up before I left the house to collect my grandsons from playgroup and school, I mustn't have fastened the gate on the puppy pen properly. 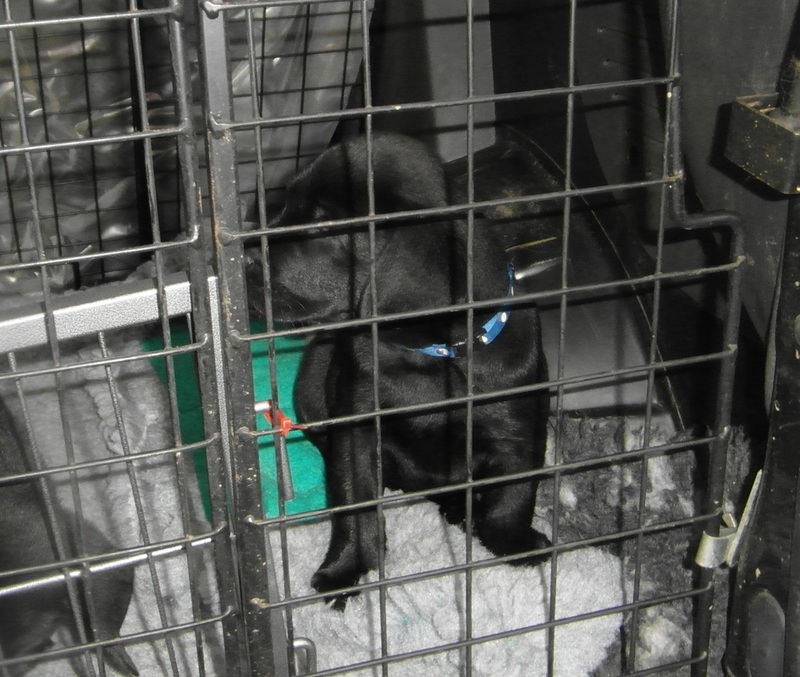 As I came back in through the door I could hear a puppy screaming, it was Annie, the only one of them that had stayed in the pen. There was pee all over the kitchen floor and pee and poo all over the lounge carpet, as well as a lot of confetti-sized paper after they'd destroyed the printer instruction booklet. They'd dragged the computer installation CDs across the kitchen floor, as well as various other discs. Finally, out of 4 telephones and an answermachine, only one phone is useable, the little buggers have chewed through the power supply to one of the phones and through the extension lead that goes through to the phone with the answermachine in the kitchen. 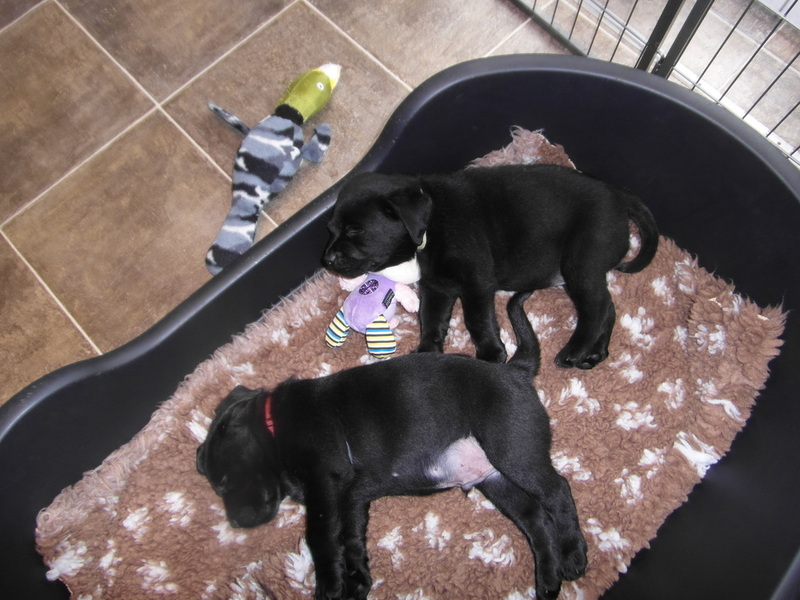 I've spent 20 minutes cleaning up, as for the puppies, they're fast asleep, oblivious to the chaos they've caused! New owners - you have been warned! 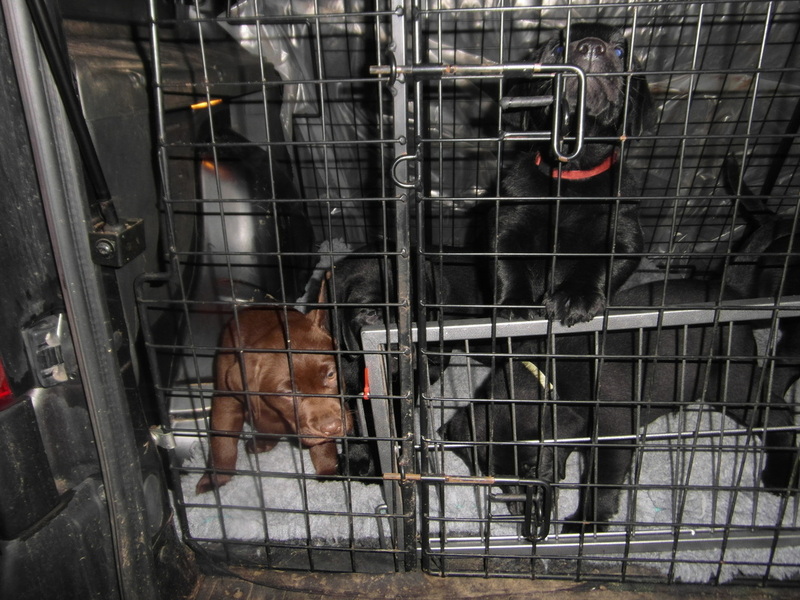 The puppies' last car journey together. 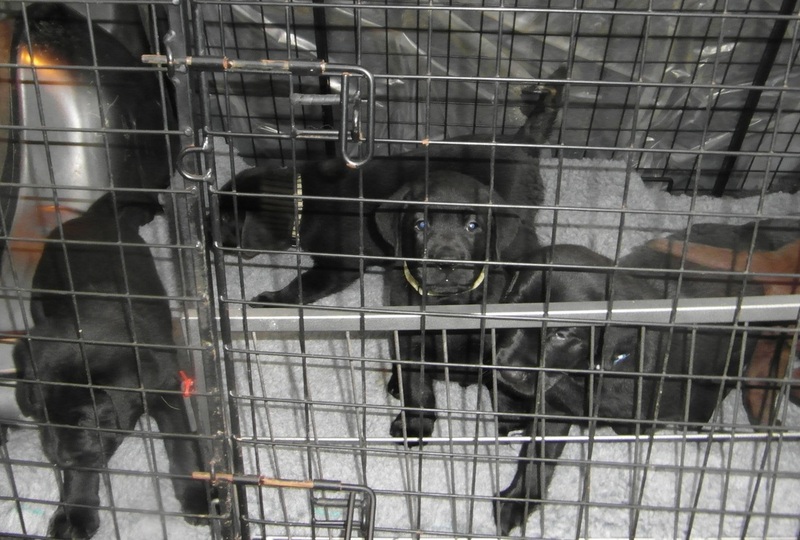 Here they are, waiting to go into the vets for their check-up before the first puppies leave tomorrow. The third photo is of them back home and relaxing after their adventure. Click on each photo to enlarge it. One of the last photos of all 5 boys together with Annie before they start leaving for their new homes.